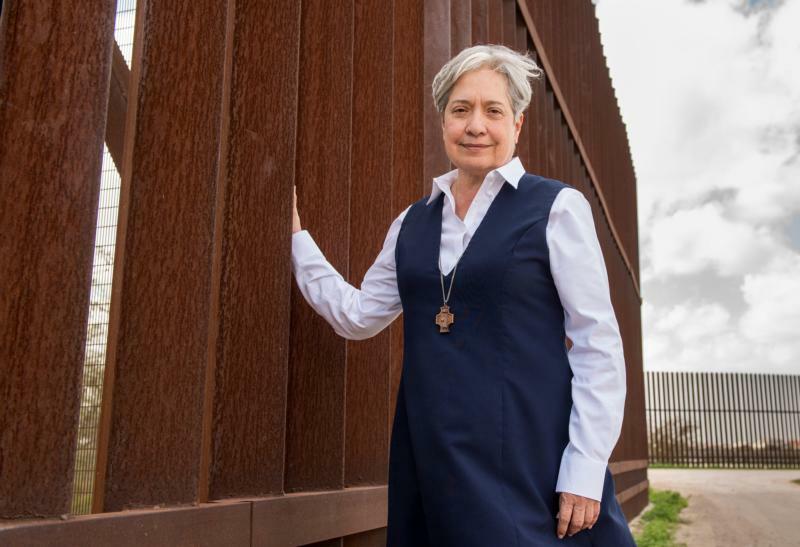 WASHINGTON (CNS) — Sister Norma Pimentel’s caring outreach to immigrants on the U.S./Mexico border earned her the praise of Pope Francis in 2015 during an ABC-TV virtual town hall meeting with the pontiff. And this past May, she was awarded the 2018 Laetare Medal from the University of Notre Dame for her ministry. It is considered the nation’s highest honor for Catholics. “The way we can give thanks to God is to care for those before us who need help,” Sister Norma said during a recent visit to Washington. She was joined by Washington Auxiliary Bishop Mario E. Dorsonville, chairman-elect of the U.S. Conference of Catholic Bishops’ Committee on Migration. The gathering raised $10,000 for Sister Norma’s outreach to immigrants, including the Humanitarian Respite Center in McAllen, Texas. Bishop Dorsonville said Sister Norma’s outreach is an inspiration to him, as are his own encounters with immigrants and the homeless community served by the Catholic Church in Washington, work that he said reflects Pope Francis’ call for the world to move from a culture of indifference to a culture of solidarity. “Sister Norma, keep up your work. The Holy Spirit is with you,” the bishop said. “They walk through the doors with tears in their eyes, and someone is there to welcome them,” Sister Norma said, describing the respite center, where the immigrants can get cleaned up, get a warm meal, and call family members in the United States. Many of them are children under 10. They’re looking for “a chance for life,” she said. “We give them orientation and guidance so they can be safe. They need someone to care,” to help them navigate the immigration process. “They cannot do it alone,” she added. Sister Norma said about 125,000 immigrants have passed through the respite center, which helps about 300 people daily. An audience member asked Sister Norma why unaccompanied minors make that journey to the border. Another woman in the audience said she and her husband are Jewish and have been supporting Sister Norma’s outreach since 2014. She compared the plight of unaccompanied minors to how some Jewish parents put their children on trains to escape Nazi Germany. Another woman at the dinner likened recent events in the country to “the longest dark night of the soul, but Sister Norma said working in defense of human life and dignity offers glimmers of light and hope. “I have so much hope in humanity, and in people like yourself,” she said.